Evenwel v. Abbott Supreme Court case: State districts count voters or total population. Conservatives ask the Supreme Court to restrict states’ rights and overturn precedent. More equal than others? 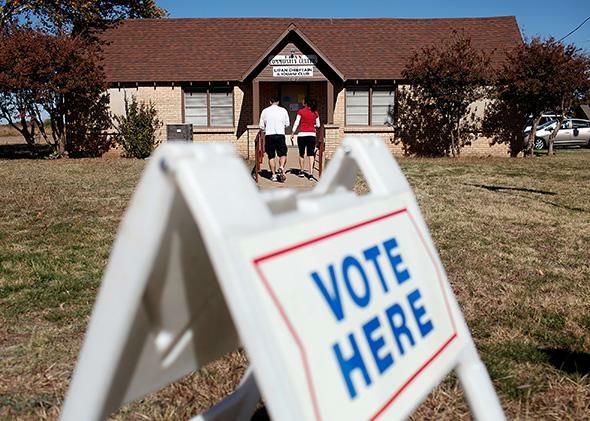 Voters exit a polling location after voting on Nov. 6, 2012, in Lipan, Texas. For the second time in a year, the Supreme Court has agreed to wade into an election case at the urging of conservatives. In both cases it has done so despite the issue appearing to be settled by long-standing precedent. In a case expected to be decided next month, Arizona State Legislature v. Arizona Independent Redistricting Commission, conservatives asked the court to bar states from using independent redistricting commissions to draw congressional lines. In a case the court agreed to hear Tuesday, Evenwel v. Abbott, conservatives asked the court to require states to draw their legislative district lines in a particular way: Rather than considering the total population in each district, conservatives argue, the lines should instead divide districts according to the number of people registered or eligible to vote. Most states use total population for drawing districts, which includes noncitizens, children, felons, and others ineligible to vote. In both Supreme Court cases, there is great irony in the fact that they are being brought by conservatives, who usually claim to respect precedents and states’ rights. The challengers are not only asking the court to revisit issues that seemed to be settled by decades-old precedent. If successful, these cases will undermine federalism by limiting states’ rights to design their own political systems. A ruling favorable to conservatives in the Evenwel case, especially if extended to congressional redistricting, could shift more power to Republicans, who are more likely to live in areas with high concentrations of voters. The Arizona State Legislature case concerns the question of who gets to set the rules for congressional redistricting. The Constitution’s election clause gives that power to state “legislatures,” subject to be overridden by Congress. The question is how literally to take the word legislature and whether only the state legislature qualifies. Supreme Court precedents going back to the beginning of the 20th century read the term broadly to include, for instance, redistricting plans approved by the voters. Although the issue looked settled before the Supreme Court took the Arizona case, there is now a real chance the court will hold that removing the legislature from redistricting decisions is unconstitutional. That decision would be unfortunate. In places like California, for example, voters approved independent redistricting commissions as a way to take self-interest and partisanship out of the redistricting process. This should be a legitimate choice for states to make, especially in the eyes of those committed to states’ rights. Yet the court may soon take this important option off the table for congressional districts. It may also bar the use of voter initiatives to make other changes in congressional elections, such as mandating open primaries. Perhaps even more is at stake in the Evenwel case, from Texas. A ruling that states may not draw legislative district lines taking total population into account will benefit rural voters over urban voters, and that will benefit Republicans over Democrats. Urban areas are much more likely to be filled with people who cannot vote: noncitizens (especially Latinos), released felons whose voting rights have not been restored, and children. With districts redrawn using only voters rather than all people, there will be more Republican districts. Evenwel involves the issue of state legislature redistricting, but you can bet that if the challengers are successful in this case, they will argue for the same principle to be applied to the drawing of national congressional districts. It is not clear whether the ruling would apply to congressional districts, because the one-person, one-vote principle for congressional districts has a different source in the Constitution (Article I) than the 14th Amendment’s Equal Protection Clause, which applies to state legislatures. But logically, the two cases are likely to be treated the same, and the result could be more congressional districts tending Republican, helping Republicans keep their advantage in the U.S. House of Representatives. In Evenwel, once again, the issue appeared to be settled. Back in 1966 the Supreme Court considered the issue in a case called Burns v. Richardson, holding that Hawaii could choose total population or total voters as its method of drawing district lines. The court’s point about why this was the state’s decision celebrated the values of federalism: “The decision to include or exclude any such group involves choices about the nature of representation with which we have been shown no constitutionally founded reason to interfere.” Although courts have periodically been asked to revisit the question, Adam Liptak reports that all the courts of appeal to consider the question have ruled that total population is a permissible basis for drawing district lines. And it is not even clear we have good measures of citizen population, meaning there could be great errors in how newly ordered redistricting following Evenwel would be conducted. We are also not sure if district lines would be based on the number of actual or eligible voters, and that alone could make a big difference. The conservatives behind Evenwel don’t seem bothered much by the intrusion on states’ rights that a decision in their favor would engender. That’s because they are motivated more by the fact that noncitizens are getting representation, and in their belief that this is “diluting” the voting power of citizens. They are the same people who backed attacks on affirmative action at the Supreme Court in the Fisher v. University of Texas at Austin case and successfully got the Supreme Court to strike down a key portion of the Voting Rights Act in the Shelby County v. Holder case. It is an agenda not about states’ rights but about getting the Supreme Court to force states to empower conservatives and force onto all of us the theories of representation and power they envision.